“LTP has been collaborating with Anne Prahl from concept+design to explore more sustainable approaches to designing and developing active sport and outdoor collections, by commissioning reports on sustainable innovation trends and brands. This initial project led to the design of an innovative yoga-inspired collection, which Anne developed in close collaboration with the R&D team at LTP’s innovation center in Lithuania. “The styles will be displayed during Performance Days in Munich on November 28-29 and in our showrooms in Lithuania", says Chief of Sales Zaneta Seremetiene from LTP. Yoga and yoga-inspired workouts, have become an important segment of the fitness and well being scene and participation is growing continuously. Active yogis fit their practice into their day at the yoga studio, the gym, the park, the beach or at home, whether in a group or alone. Jersey wool V-neck cover-up worn over digitally printed, jersey tencel, cotton & elastane reversible bra and combined with Edelweiss cotton, modal & elastane capri pant. Yoga retreats and adventure holidays in exotic, remote and beautiful locations around the globe, where spiritual and physical practice come together, are also growing in popularity. As a result, yoga apparel needs to be versatile and multi-functional, as active yogis like to wear clothes that are suitable for commuting and travelling to and from practice, can be worn in the city as well as in the great outdoors and can be layered up for changing temperatures and weather conditions. Many yogis already care about low impact travel and commuting, choosing to eat a plant-based diet and choosing accessories made from natural and renewable materials, such as cork and jute yoga accessories. Anne’s prediction is, that in line with this trend for more mindful and sustainable consumption, consumers will start to look for products that have been designed and manufactured inspired by the yoga philosophy of caring for the world and its inhabitants, both human and animal. To illustrate this trend, this collection showcases eight versatile styles, which utilise natural, renewable and bio-based materials including merino wool, cork-coated tencel/cotton, bio-coloured wool, tencel/smartcel, organic cotton and Edelweiss cotton/ modal/elastane. The first outfit features an organic cotton yoga pant and tencel & smartcel long-sleeve tee, worn under a cork-coated tencel & cotton cape. The cover-up cape was designed as an active layering piece for those wanting to practice outdoors and thanks to the innovative cork coating (Tintex), this piece is water-resistant and breathable. The yoga pant is made with GOTS certified organic cotton (Fieratex S.A.) and utilises knee vents to provide ultimate comfort and freedom of movement. The racer-back long-sleeve tee is made with a super comfortable tencel/smartcel/ elastane fabric (Tintex), which adds both UV protection and antibacterial properties. This piece also offers extra ventilation and freedom of movement during more vigorous poses, while providing enough coverage and warmth during easier and resting poses. The second outfit consists of the quilted panel sweatshirt, which was designed with a cut-out detail to enable movement and ventilation during practice, while providing enough warmth for outdoor practice in cooler conditions. The style is made from GOTS certified organic cotton (Fieratex S.A.) and the suede finish adds extra comfort and cosiness. The reversible bra, made from tencel, cotton & elastane fabric (Tintex), is digitally printed on one side to offer the wearer a plain and a patterned side for greater outfit variety, while travelling light. 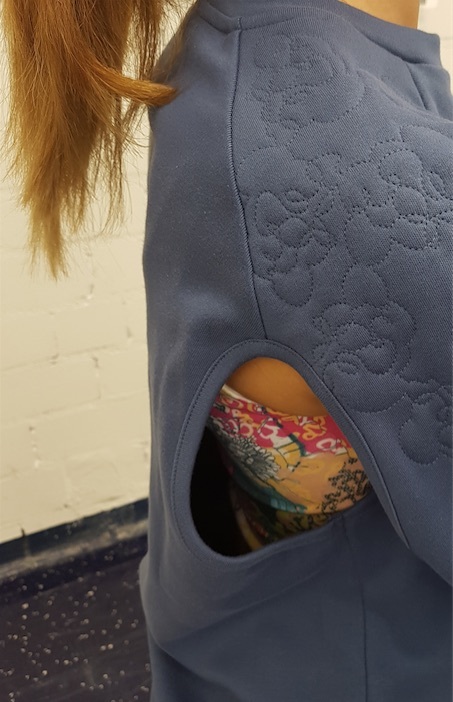 The print was added to the finished piece by digital printing specialists Faering in the UK, who offer this unique digital printing process for natural fiber-based garments and accessories. The third outfit presents the long-sleeve V-neck cover-up, which is made with a lightweight and soft jersey wool (Tintex) to offer a loose and relaxed feel and provides a slightly sheer aesthetic, which comes to the fore when layered over a printed bra or vest. This style showcases Tintex’ experimental bio-coloration technology, achieved through the use of natural extracts. The capri pant, made from Edelweiss cotton, modal & elastane fabric (Fieratex S.A.), is designed for practice indoors or during warmer temperatures and provides ultimate comfort through a relaxed cut and fit. The fabric is described as extremely durable and anti-pill and is therefore the perfect piece for regular use and travel. An additional piece, the wrap-over gilet is made from a 93% merino wool quality (Thygesen & Birk), which is combined with 7% Nylon to provide better durability. This is the perfect layering piece for commuting to class or travelling and will keep the wearer at the perfect temperature whether they are on the move or resting. “This collection showcases what is possible today, when we start to explore the use of existing bio-based and renewable materials, as well as coloration and finishing methods. The industry is only at the beginning of this journey but I am really excited about emerging and future innovations in this sector, in order to create sportswear that considers both environmental and the wearer’s well being” says Anne. Tintex, Fieratex, Thygesen & Birk and Faering. ANne is a London-based research, design and innovation consultant with over 25 years of experience in the fashion and sportswear industry, where she has worked for brands including Nike, Puma, Ellesse, Esprit, Speedo, Marks & Spencer and trend forecaster WGSN. Since completing her Master’s Degree in Design for Textile Futures from Central Saint Martins College of Art & Design in 2009, she has been specialising in design-driven sustainable innovation, which explores opportunities to improve resource efficiency across design, development, materials and manufacture, as well as enabling more considered consumption and product end-of-life. 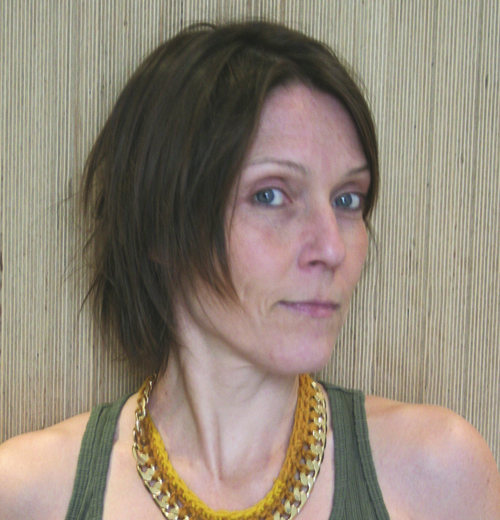 Anne’s projects are diverse and include design research and writing, trend forecasting and analysis, creative direction, design concepts and product design & development, sustainable design strategies for global brands and start-ups, sustainable textile, process and product design consultancy and inspiring other industry professionals through webinars, bespoke workshops and training, tailor-made tools and mentoring. LTP is a Danish-owned garment manufacturer for 60+ premium brands within Active sportswear, Outdoor, Soft Sport and Sustainable Fashion. LTP was established in 1991 and is probably the biggest functional garment manufacturer in Europe with bluesign® setups in Lithuania, Belarus, Ukraine and Vietnam.